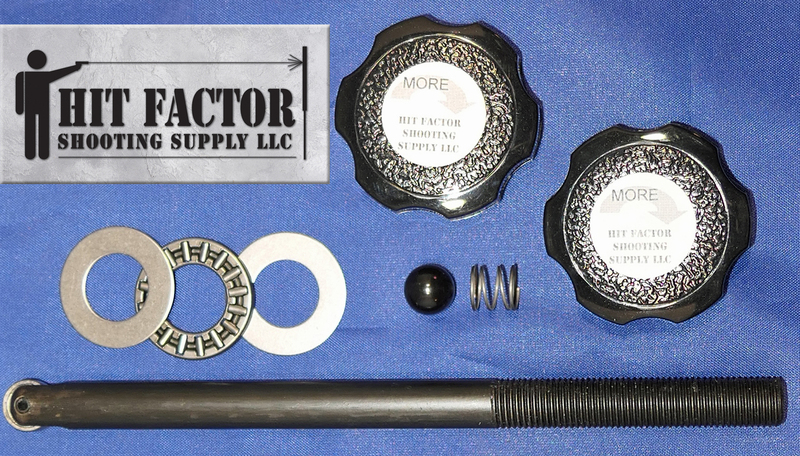 Our kits help you get the most from your Dillon reloading machine. No re-adjustment of dies is needed with any of our kits! As the Shellplate bolt is tightened there is additional friction between the shellplate and the press. The shellplate bearing overcomes this friction. This stabilizes the shellplate and reduces run out. This will dampen the motion of the shellplate, reducing powder spills as it moves into position. You will also experience a better feel for each operation. Decapping, priming, and seating each have their unique feel. You'll know when a primer isn't right. With the reduced run out, case overall length will be more consistent. The result is a better operating press, consistent ammo, and increased run rates. Lubricate the bearing with a little grease, don't pack it like a wheel bearing. If the grease is collecting gunpowder on your press that's too much. We use Mobil 1 or Slide-Glide. We used to sell the oil-lite thrust washer kit. Feedback from our customers told us it wasn't a good value. The needle bearing has a far greater range of bearing preload making it much easier to tune precisely. We still have a pile of these oil-lite washers. If you want to try one send us a message before you order, we'll add it to your order for 25 cents (fits 550 or 650). Then you can decide. Our Low Mass Detent Ball for the Dillon XL 650, SL 900, and RL/Super 1050 is tough as nails. This phenolic ball is super hard, smooth and lightweight. It's approximately 7 times lighter than the factory steel ball and every bit as tough. The low mass detent ball has less momentum when it locks up with the shellplate. The material also absorbs vibrations much better than the steel ball. This detent ball is highly abrasion resistant and will not be cut or scared by the shellplate. These are industrial grade and used when strength and abrasion resistance is required. Both the low mass detent ball and reduced power spring are custom made to our specifications for this purpose. We didn't settle for off the shelf products that are close enough. The camming pin bearing replaces the camming pin on your XL 650 or SL 900. This is a sealed bearing, as such, no maintenance is required. It smoothly rides the case insert slide cam. You won't need to lubricate the cam to prevent wear, resulting in a cleaner press. To install remove the locknut with a 9/16" wrench, unscrew the original pin and screw in our camming pin bearing. Each half revolution of the camming pin bearing is .020" of adjustment. Before you tighten the locknut ensure the bearing rides square on the case insert slide cam. Use a 1/8" allen wrench in the hex at the end of the pin, to hold it steady and aligned when tightening the locknut. We match the dimensions of the OEM pin. Our pin fully supports the casefeed arm, reducing vibrations and unnecessary wear. Reduced vibrations helps to keep cases correct side up when using a casefeeder. This is an exclusive feature of our pin, not available from any other manufacturer. 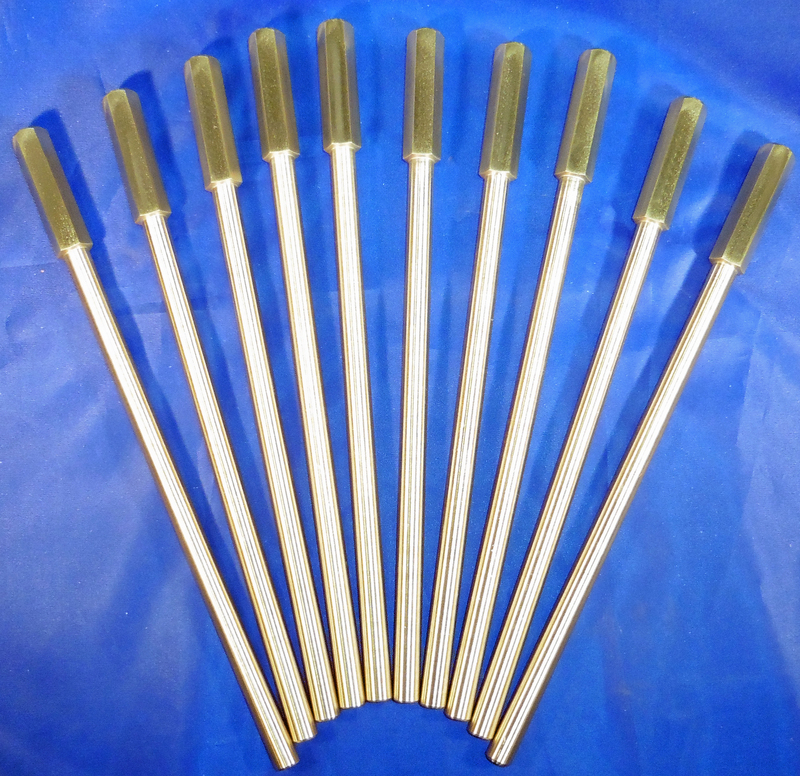 We make this camming pin here in our shop, using tool steel. 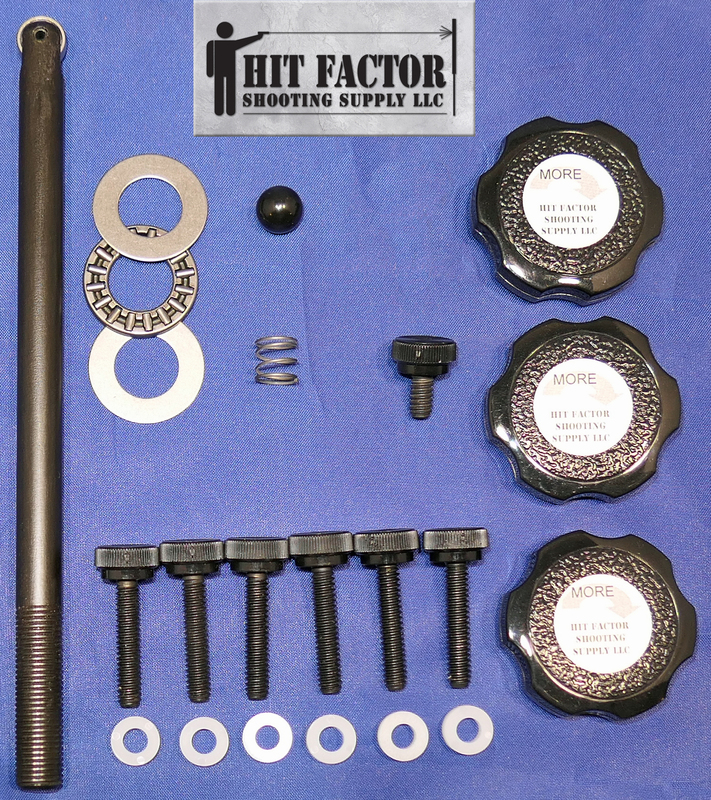 Our Ultimate and Premium kits come with an assortment of screws, knobs and washers specific to your press. Large knobs fit over the nut of the powder adjustment bolt. This makes adjusting the powder drop a snap. The included label indicates which way to turn for more powder and you won't need a wrench. It may take a day or two for the plastic to form to the nut, or you can warm the plastic a little before installation to speed up the process. Thumbscrews are installed on the powder measure clamp. You will find not needing to reach for an allen wrench while adjusting the case bell makes the process go faster. Nylon washers are installed under these thumbscrews. To stay tight they must sit flat on the powder measure clamp. These need to be fitted, use sandpaper, a file, or grinder to create a small bevel on one side. There is a washer grinding video on our FAQ page. Thumbscrews are also provided for the die clamp screw (650 & 1050). 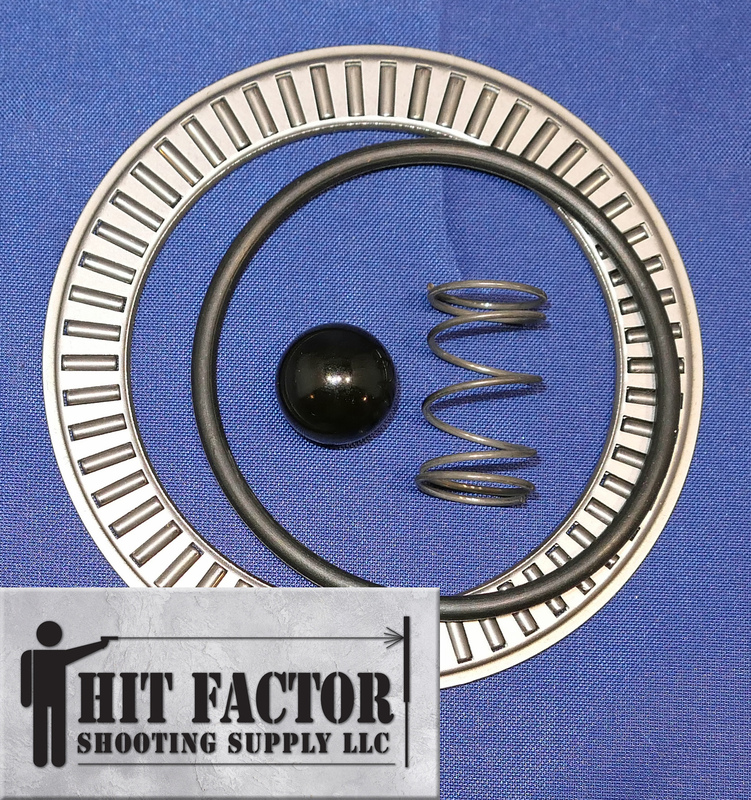 Hit Factor Shooting Supply, LLC is a proud sponsor of the 2018 Great Lakes 3 Gun Championship at Bend of the River Conservation Club. We have been a sponsor of this event every year since the inaugural match. Cart opens in another tab. The 550 kits work with all models of the 550 and 450. Ultimate Shellplate Bearing Kit for Dillon RL 550 B/C $35.95 Free shipping in U.S.A.
Shellplate Bearing Kit with Extra Length Bolt for Dillon RL 550 B/C $26.95 Free shipping in U.S.A. Ultimate Bearing Kit for Dillon XL 650 $36.95 Free shipping in U.S.A.
Shellplate Bearing Kit with Camming Pin Bearing for Dillon XL 650 $28.95 Free shipping in U.S.A. Premium Shellplate Bearing Kit for Dillon Super 1050 $20.95 Free shipping in U.S.A. If you have the older, shorter stroke RL1050 or 1050, you will need a modified lock ring. Shellplate Bearing Kit for Dillon Super 1050 $12.95 Free shipping in U.S.A. If you have the older, shorter stroke RL1050 or 1050, you will need a modified lock ring. Ultimate Shellplate Bearing Kit for Dillon SL 900 $28.95 Free shipping in U.S.A.
Brass Squib Rod $21.95 - 9mm /.357/.38/.40 Squib Rod for up to 7" Barrel $20.95 Free shipping in U.S.A. Pistol Caliber Carbine (PCC) Squib Rod $24.95 - 9mm for up to 19" Barrel Free shipping in U.S.A.
Made using a steel that is 12 to 40% softer than Chrome-Moly 4140 and R400 Series Stainless barrels. The tip of the squib rod is concave. Please oil the rod after use and before storage, this rod is 'in the white'. Sorry - Sold Out Pistol Caliber Squib Rod $16.95 - 9mm for up to 7" Barrel $16.95 Free shipping in U.S.A. If you would like to pay with personal check or money order, simply mail your order to us. Our address is in the Contact tab at the top of this page. International Orders Accepted. Shipped via USPS. International customers please note: You are responsible for duty and any other import fees levied by your country. Estimated delivery date does not account for the amount of time the package takes to clear customs. Italy is taking 4-6 weeks for delivery. Canadian Customers - Murray 'Doc' Gardner sells our products from BC, Jim Pshyk at A-Zone sells from AB and Josko Kovic sells from ON. Italian Customers - Giorgio Patria sells our products from Italy. Australian Customers - NVT sells our products from Australia. Click the dealers logo to go to their site.